I was told to check out Mark Manson’s book because it supposedly encapsulates a lot of my personal beliefs, philosophy and approach to life. 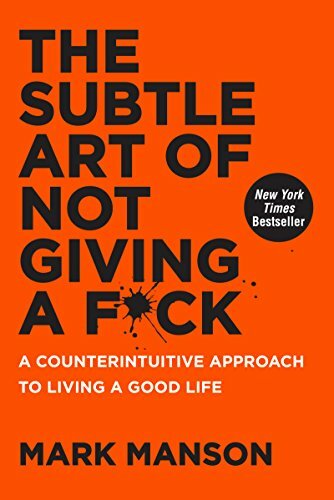 I was very skeptical of the gimmicky title and the fact that it’s essentially a self-help book, but gave it the benefit of the doubt. I was very pleasantly surprised. Mark Manson combines academic research, personal anecdotes and jokes to make a very compelling argument about what to care about. The book essentially presents Buddhist learnings in a package appropriate for modern sensibilities. It effectively shows that while you can’t control many of the negative things that happen to you, you can control how you react to them. It jives well with my personal approach of not getting upset about things I can’t control, like a plane cancellation or a traffic jam. It also argues to be judicious about the battles you fight for the things you can control. The strong recommendation in favor of radical honesty and transparency in relationships also resonated. I am partial to the style of writing that combines theory with individual interesting anecdotes that support the theory – like what Malcolm Gladwell does in Outliers. It’s also very well written. My only gripe is that the first 20% of the book are slower. As a result, it takes a while to get into it, but once it gets going, it’s very thoughtful and fun. Note that parts of it, especially the end which covers death, are quite serious and can be distressing, but remaining insightful and interesting.